THE bloody history of medieval Carcassone was brought to life in the international best-selling book Labyrinth. And now its author Kate Mosse takes us back to the south west with her latest book Sepulchre, a tale from the dark woods of the Corbières involving ghosts, murder and tarot cards. Here I chat with Kate about the mystery of the region and her writing life - also find out how to win a copy of Sepulchre - and so my first question was what frights can people expect from the new book? Sepulchre is part ghost story and part tarot tale, set in two different time periods, the 1890s in Paris and the south west of France and modern day Paris as well as the area around Rennes les Bains. It is about a young girl and her brother in the 1890s who are sent to stay with their aunt in this creepy house in the woods and when they get there they discover a strange Sepulchre hidden in the ground and within there is hidden a pack of tarot cards. Then 110 years later an American researcher who is down in the area comes across the ruined Sepulchre and realises the story of the tarot cards is all still going and that there are many secrets that have not yet been uncovered. So it’s very much a page turning, read it with the door shut and the lights turned on type of book. How frightening was it for you to work on the new book after the success of Labyrinth? It was a bit intimidating, because it is a wonderful thing to have millions of readers of Labyrinth with many people kind enough to write, email or come to events to tell you how it is one of their favourite books, so you do feel this great sense of not letting people down and you want the next book to be as successful. You want people to really enjoy it so that they won’t feel disappointed. So before I got down to writing I felt I very much had the shadow of Labyrinth over me, but once you start it’s the same as any piece of writing really, what you are thinking about is ‘does this chapter work, are these characters doing what I want them to do, is the story unravelling as I thought it would’. So once you actually get going you forget about everything except writing one sentence after another. It’s clear from both books that you love the history of the south west of France, so where did your research take you? I haven’t visited anywhere because we’ve had a house in Carcassone for 18 years so that’s where we go, the problem with having a house is that you tend to only go there rather than travel around the place. For some years I wanted to write about Rennes les Bains, not its famous neighbour Rennes les Chateau, out of which so many of the Holy Grail stories have come, but more because Rennes les Bains in the Pyrenees was this incredibly chic and thriving spa town in the 1890s and now it is this tiny, quiet, little village, that’s a very nice place. But it was just so interesting to compare it to the pictures and reports of the place in the 1890s to the present day, so I had it in the back of my mind that I would like to write about there. So Rennes les Bains, Couiza, Esperaza and Limoux are places we visit a lot when we are home in Carcassone, as it is a very different sort of atmosphere to the medieval past of the city, it is much more domestic, if you like, and it is more about the greenness of the mountains. And I very much like the woods around Rennes les Bains, I find it a very inspiring atmosphere to write about. What do you “see” when you walk around Carcassone and the region, as I suppose the history must almost ooze out of the walls? One of the things I was looking forward to writing about in this new book was to write about Carcassone in the 1890s when the town hall made a decision to be a tourist destination. Because people most probably know about the present day and the medieval past, but it was a quite conscious decision, on the part of the town, to invent itself as a place for tourists and so the city was restored over a period of time to encourage tourists to come and visit. So when I was researching for Labyrinth I thought that one day if I get the opportunity I would love to write about the 1890s moment, when the city became a place where people went. And I thought that it is not just that the history is there but that it is a conscious, crucial part of the present of the region and is therefore maximised everywhere, so it is not a random thing if you like, that the history is so evident it is very much part of a plan to make it a place that people visited. Do you see Labyrinth being used by the tourism industry in Carcassone, how do you feel about that? I’m a bit mixed about it really, because on the one hand you are delighted as I spent years and years writing both books, so seeing people reading them is fantastic. When we were in Carcassone in the summer there was someone waiting to go into the Cateau Comtal holding a copy of Labyrinth who asked me if I’d read it. And I heard myself saying no. So it feels like a public thing. I’m told by French friends in Carcassone that the French guides also use Labyrinth for describing things, I don’t know if that’s true or not. But on the other hand one of the reasons behind writing Labyrinth, and now Sepulchre, was to say these are amazing places, so go and visit them for yourself. So it was a conscious way of trying to share my real love of the region. Sepulchre is very much about the green Corbieres, very much about Limoux and the south and I do want people to go and find the amazing landscape and find out what a great place it is. How different is a writing day in France compared to one in the UK? Do you undertake different projects in each country? No, a lot of writers have one place where they can work, and are very set, but I’m not really like that. I have a tiny little laptop and find that I work just as well in my home in England as I do in Carcassone, the only thing that is common to both is that I start very early, carry on through the morning and a little after lunch, then I clock off. And that is the same whether I am in Sussex or in Carcassone, I just work better in the early mornings. If I’m researching I have a different pattern but when I’m actually writing, I work for eight hours a day, seven days a week until it is done. Everybody knows that I disappear into this awful tunnel. But I always write in my pyjamas, so I think a lot of people must think I am a long term invalid. I don’t think about it but the postman most probably thinks I’m ill.
Where does the love affair for France come from, would you have written the books if you’d not lived there? No, well at least they would have been very different books. I had in my mind a series of novels that were part historical, part contemporary that used mythological items, or mystical items, such as Grail legend, or in this case tarot. But I had thought Labyrinth would have been set in ancient Egypt actually, it was a consequence of buying the house in Carcassone, which came about by a series of random coincidences, it could have been anywhere, it just happened that my mother-in-law had a friend who was an estate agent, who had a twinning agreement with an agent in Carcassone. And that is what is so terrifying, if she had a twinning somewhere else, who knows what would have happened. But when I got to the region I just fell completely in love with it and felt it was the landscape of my imagination. So it’s not that I wouldn’t have written the novels, it is just that they would have been different books. Sepulchre would not have happened if we didn’t know Rennes les Bains, and Labyrinth wouldn’t have either if I hadn’t discovered Cathar history. Are you looking to France as the background for future books? I doubt if my next book will be set in France. I feel that as a novelist you have to keep some of the elements that you know your readers like, but not jus repeat the same thing over. So Sepulchre and Labyrinth were conceived as a pair, two different time periods, but the same sort of area. But I suspect the next one will not be set in France, I think it would be good to have the challenge of writing in a different sort of landscape, so I think next time I am more likely to be writing about Egypt. You will find out more about Sepulchre by Kate Mosse on Amazon, and if you go on to buy a copy I receive a small commission that helps go towards the upkeep of This French Life. Know what she means about not seeing other parts of France. We've been here 9 years and have hardly moved out of the departement! Labyrinth was so good, thanks for bringing Carcassone to life. Sepulchre is definitely on my Christmas list! I am going out today to buy Labyrinth. 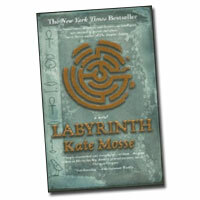 Labyrinth - great reading, and the audiobook is fab, too. Looking forward to getting Sepulchre. I found the French translation of Labyrinth rather clunky, but still very much enjoyed the story! I look forward to reading Sepulchre, in English though! Kate Mosse is a very clever and gifted author, can't wait to read Sepulchre. Having had an interest in tarot since a (mis-spent) youth, I will definitely be reading Sepulchre. Thoroughly enjoyed the first book and hope to be drawn for the second! Loved the 'Labyrinth' and found it a really exciting tale so am delighted to find that there is a new book by the same author. Will really look forward to reading that. As others have noted, I enjoyed Labyrinth immensely and can't wait for Sepulchre. I'm fascinated about what Kate says about almost setting Labyrinth in ancient Egypt as I am the librarian at Chicago House in Luxor. Thought it was going to be a bit too chick-lit-ish (If that may be used as a word) but I thoroughly enjoyed it. So much so that, to paraphrase the man from Ronson, I bought a house near Beziers! looking forward to living there and exploring the history. Captivated by Labirinth - especially as we have recently moved to the area. Now looking forward to Sepulchre. 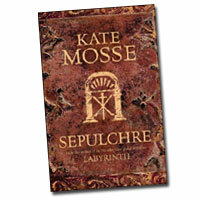 I loved Labyrinth and am looking forwrd to getting stuck into Sepulchre. The mix of the setting and the history just cant help but pull you out of reality and made it an unputdownable read. Nice interview. What a delightful, self-effacing author. I'm putting Rennes les Bains on my itinerary. I have a copy of Labyrinth which I was saving for the Christmas holiday - can't wait to read it now having had my appetite whetted! I loved Labyrinth and took it with me to Carcassonne last summer. I loved Carcassonne so much I returned with a friend for a crazy weekend and cast the spell on her. We will both be back. This prompted other friends to go. What a magical place, a mesmerising book and the promise of another to immerse myself in this Christmas, Sepulchre. Thank you for Labyrinth. I was so immersed in the story of Alais and Alice. You are lucky to live beneath the walls of Carcassonne. When i return I'd love to spend some time chatting to you. I am ashamed to say I haven't got round to reading Labyrinth yet but is top of my "to do" list. Looking forward to getting involved in it as you can with a good book and also Sepulchre after that. Once the Christmas rush has died down I can put my feet up and enjoy - can't wait! So loved Labyrinth. Kate's the tops cause I've read it the mostest. It was even my choice for our bookclub review. Hope Santa knows his way to France this year. Sounds interesting, hope I win! I read Labyrinth during our first year in south west France and found it fascinating. We accidentally discovered Carcassone during a house hunting trip. I'm really looking forward to reading Sepulchre. I haven't read Kate's books so would love to win this copy! The competition has now CLOSED and thanks to my random number generator comment number 11 from Ann, posted on November 28 was the winner. Many thanks to everyone who left a message and it's clear that Kate's books have many, many fans.